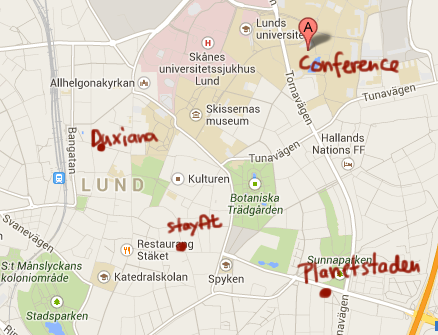 How to get to Lund? By plane, the usual way is to fly to Kastrup airport. There are trains (Öresundståg) every 20 minutes from the airport to Lund, and these take approximately 35 minutes. It is also possible to fly to Sturup airport, where there is a bus service to Lund. Domestic tickets are usually cheaper to Sturup. By train, Lund is serviced by SJ, Veolia and Öresundstågen, which have frequent connections to most Swedish and scandinavian cities. 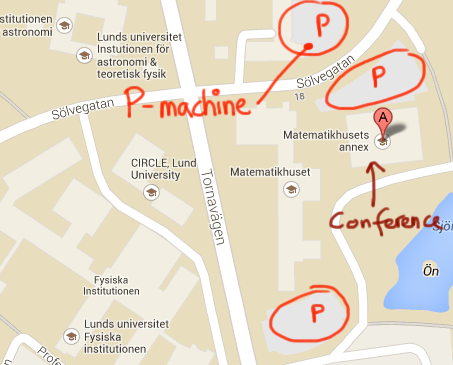 The conference takes place in the auditorium MA:07 in the Annexe of the Centre of Mathematics in Lund. In google maps, you can search for "Matematikhusets Annex". In the following image, the three closest places to park have been indicated in red. Warning: While there is only a parking machine at one of these parking zones, all of them require that you use it. The machine accepts most credit cards, and the daily rate is 25 SEK. We recommend the following three hotels in Lund: Hotel StayAt Hotel Planetstaden Hotel Duxiana All hotels are between 15-20 minutes walking distance from the Centre for Mathematical Sciences. The hotels are loosely indicated on the below map.